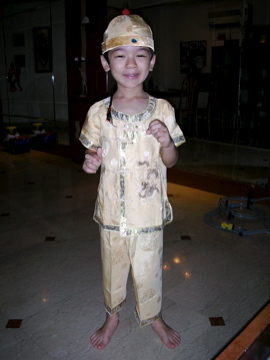 The main event was Chinese new year, a four-day holiday for us since if fell on a Monday and Tuesday. On Saturday we cleaned the house, and in the afternoon Naoko’s cousin Yuki and her fiancee Paul came to visit us for two days. That was a lot of fun, and I took tons of pictures. We went on the first night to Muthu’s Curry in Little India, then wandered the streets for a bit. Great food, great fun. Sunday we headed off to the Botanical Garden where we met Mitchan, An-chan, and Manae. 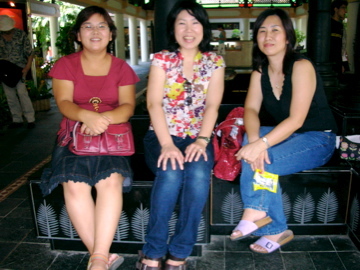 Mitchan, Naoko, and Yuki were good friends in Tainan, where all of us met in the first place, so it was a good reunion for the ladies (but not really for the guys, since were in three different eras almost). The botanical garden was fun, and Paul and Yuki enjoyed the cactus garden. Zen rolled around on his scooter. We went home for a nap, and when Zen woke up we went off for a walk downtown. 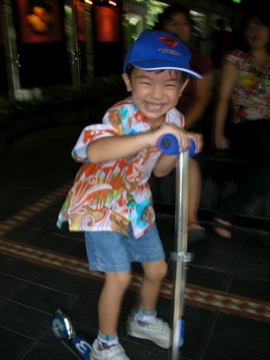 Hung out at Raffles hotel, took silly pictures at the merlion, tried to eat at Black Angus (closed!) 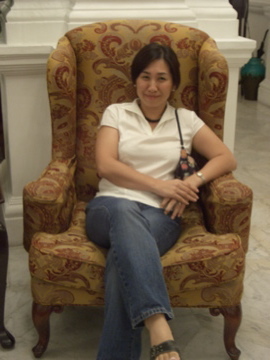 chilled out in the Fullerton, then went for dinner at Harry’s. There were fireworks at the harbourfront, which we could partly see from Harry’s (but we would been practically right UNDERNEATH if we had sat at Black Angus, boo on you B.A.). Oh well. Monday morning Paul and Yuki took off, and Naoko and Zen and I chilled out. Tuesday Naoko’s colleagues came to see us for a fun party, that was good. I spent a lot of time working on an article, or playing guitar, or eating food or drinking beer. Nice day. On the weekend of the 24th we went to two lion dances over here, one held by the estate, the other held by Zen’s friend Lucas. That was a lot of fun for both of us and I got some nice pics. 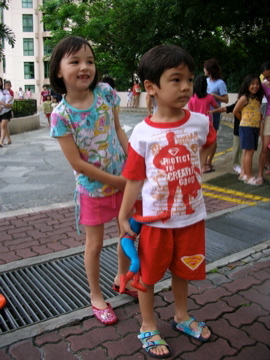 The weekend of March 11 Zen went to his friend Eunice’s birthday party. 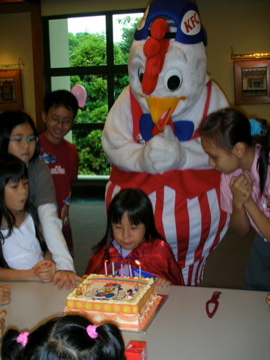 They got Kentucky Fried Chicken to provide food and entertainment, so they brought out their 6-foot chicken “Chicky” to play with the kids. Did a lot of errands. 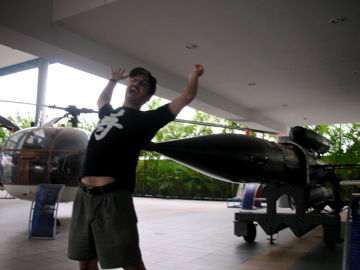 We booked our trip to Thailand, finally, so had some trouble getting a room in the resort we want to go to, but then finally got the room in Hoi Hin, the room in Bangkok, and the flight. Yay, our 10th wedding anniversary in Thailand, and our first trip together in nearly a year. Last weekend was quite chilled out. 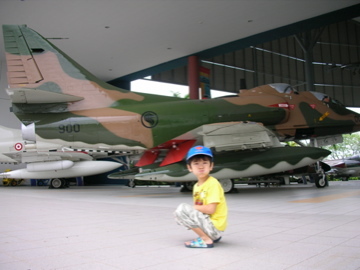 Saturday morning Zen and I went to the Air Force museum to see the 6 jets and 4 helicopters they have. Getting there was quite a task, and it was in the middle of an industrial area that hahd a lot of construction, but we survived regardless. Went home, napped, and I finally did some writing on my novel. 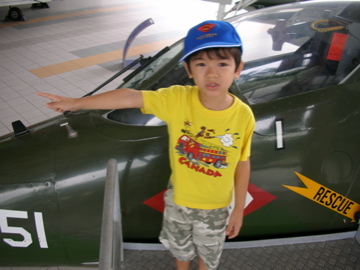 Went to see the Malaysia train. Sunday I went to Jurong East to pay a bill on my new credit card, Zen came along for the bicycle ride. Strange system they have in Singapore for crossing roads as a pedestrian (or a cyclist), but I managed to figure out how to get there. Zen’s swimming lesson, and some more Malaysia train. 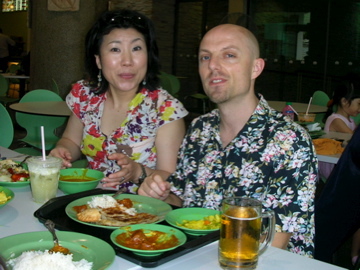 Peter, Naoko and Zen at Muthu’s Curry in Little India – yummy! 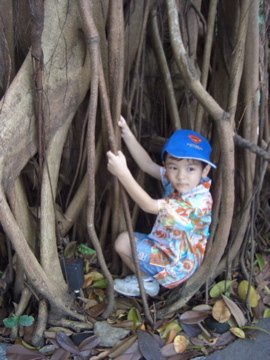 Zen hiding inside a tree?!? 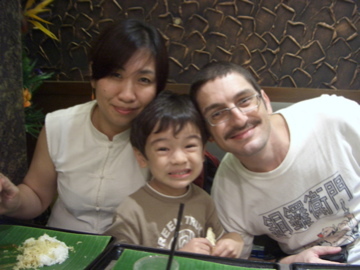 Paul, Yuki, and Zen. Oh Zen, where are your hands?!? Your money or your life, mister! 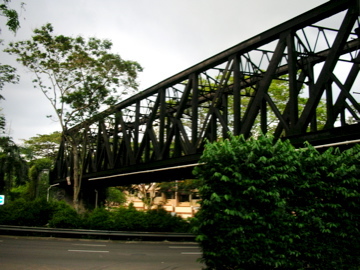 The iron bridge of the old Malaysia train line crossing Bukit Timah Road. There was probably once a wide river here, but now it’s a runoff with a busy road flowing below.